If it wasn’t the biggest political faux pas, Suthep’s declaration has to be the most daring political statement made in Thailand’s recent memory. Thai political observers were aghast. Unsurprisingly it drew strong criticisms from many quarters. Many weeks have past since and criticisms mounted (even the Bangkok Post and The Nation called it a “sheer dictatorship, more than a step too far” and “equivalent to a coup d’etat” respectively). The caretaker government has called it “treason” and pressed the army to declare its stance, although the army chief has been rather circumspect. 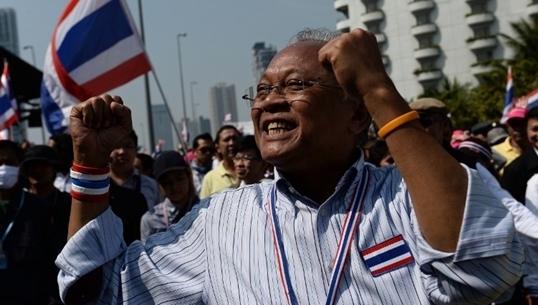 Suthep remains unfazed. On May 3, a few days before the Constitutional Court is expected to rule on the fate of the caretaker PM on the transfer of the previous national security chief, Suthep vowed once again in a 3-step action plan to oust the Thaksin regime “once and for all.” He will lead the “great mass of people to reclaim sovereign power” because the sovereign power belongs to the people, he said, citing Article 3 of the Constitution. Since Suthep has made public his intention to declare sovereignty, no other reaction to his controversial plan has been as strong—or as well received—as the one from a well-known senior political scientist and Royal Institute fellow Professor Likhit Dhiravegin. Professor Likhit, who had a brief stint as a politician (he was a political party leader for a year during 2006-2007), has kept a low profile politically in recent years. Likhit’s impassioned one-hour-long interview has been widely praised for its clear and empathic explanations and arguments. It’s fair to say his interview was a Political Science 101 lecture, which has been viewed more than 178,000 times since it was posted on YouTube on April 11, 2014—a high number for a Thai political interview. The interview received loud cheers from pro-democracy progressives, as well as the pro-government and politically “neutral” quarters, but little reaction from the pro-establishment side. Part 1 includes the translation of the first half of the interview, which was conducted in Thai and hosted by Jomquan Laophetch of Kom Chad Luek TV. The remainder of the interview are covered in Part 2 and Part 3. The English translation is done by the author from the Thai language transcript provided by Prachatai. Jomquan: There’s been a lot of debate on the concept and definition of the term รัฏฐาธิปัตย์ (rattha-thipat), and there are many terms: rattha-thipat, องอธิปัตย์ (ong a-thi-pat), อํานาจอธิปไตย (amnart a-thippatai) and ปวงชนชาวไทย (puang-chon chao-thai). What do all these mean and how do they relate to one another? Prof Likhit: The term รัฏฐาธิปัตย์ (rattha-thipat – “sovereign”*) means one with supreme power in the land relating to governing; this could be an individual or a group of individuals. As for อํานาจอธิปไตย (amnart a-thippatai – “sovereign power”), it is derived from the people, which is called “popular sovereignty” (อำนาจอธิปไตยเป็นของปวงชนชาวไทย). That is the basis of legitimacy. Legitimacy must be based on the people. The people vote in elections. For instance, the President of the United States is elected by the American people, the President is องอธิปัตย์ (ong a-thi-pat – “the sovereign”) but the power still rests with the American people who have the right to vote. Therefore, these two concepts sometimes need to be distinguished. Those who talk about “sovereignty” from Article 3 don’t know what they were talking about; they talked without knowledge. And those who cite the reference are totally off course. It’s worrying the country is being led astray. On the concept of rattha-thipat (“the sovereign”/“sovereignty”), humans are social animals and we live in groups. When in living in groups, conflicts are unavoidable because there are limited resources. If conflicts occur and we use only brute force in absence of rules, we would go eventually extinct. Someone with a good mind could see the peril so they established themselves, for instance, as the leader in the hunt and assumed power to organize society, using helpers, division of labour, social roles and statuses. This is called “political organization.” The leader set the rules and resource distribution and the people accepted and followed the leader because if not they’d be hit on the head. This is the origin of “the State.” There was society and then came the State. “The State” is an abstract. The group of people who exercise state power to govern is called the “government.” They have supreme power, are the sovereign and accepted by the people due to fear. But using only fear was not sustainable long term, so a “tradition” was created for popular acceptance, often by claiming divine right to rule. Westerners claimed divine power from God, the Chinese from Heaven and the Indians from Devaraja [God King]. Through generations [the tradition] was accepted and there was no need to use force as legitimacy was established. Therefore, royal succession is succession of sovereign power. Kings in ancient regimes were the sovereign. Louis XIV of France once said L’État, c’est moi”—“I am the state.” Sovereignty in one person in the entire country of France. That is the clearest example of the sovereign. Later as society changed, there were wars and then came distribution of power, from the Magna Carta todemocracy, [with which] came elections. Those elected become the sovereign but only temporarily. For instance, the President of United States has a four-year term, and is the sovereign during that term, while political legitimacy rests with the people in popular sovereignty. So there is a distinction between political legitimacy from popular sovereignty and the sovereign. From tradition to legal rationale and law—this is what was said by Max Weber—if the latter two are problematic, a “charismatic leader” or “charismatic authority” arises. This kind of leader does not come from power but from a popular faith in his/her personal special quality. So now we have four kinds of sovereign/sovereignty: from brute force, from tradition, from law and legal rationale, and from special quality or charisma. Article 3 of the Constitution is about sovereignty of the modern kind, in which sovereign power belongs to the people. Meanwhile, the King as the Head of State exercises that power through National Assembly, the Council of Ministers and the Courts as provided by the Constitution. That means in Thai society the sovereign power belongs to the people but is not exercised by the people but by the King through the three state bodies mentioned. But the National Assembly must come from elections to reflect popular sovereignty. Once the elections are completed, the prime minister is royally endorsed. This is a co-exercise of power between the people and the monarch. And the reason it is this way is because Article 2 states very clearly that, “Thailand adopts a democratic form of government with the King as Head of State.” So you can’t cite only Article 3. You can’t cite Article 3 to form a government without mentioning Article 2 which says it must be a democratic form of government, or without mentioning [the rest of Article 3] that the King exercises that power through the National Assembly, the Council of Ministers and the Courts. So be very careful, you can’t just refer only to the people. Read the Constitution carefully and make sure you understand it well. Don’t mix it up. Prof Likhit: The power as prescribed in the 2007 Constitution, there is a process to exercise it, in which there must be elections. There must be a parliament and voting for a prime minister in the parliament. You can’t just suddenly claim power and do as you wish. If you want to do that, you must cancel the Constitution first—by staging a coup. But be warned, the 2007 Constitution came from the September 19, 2006 coup. It was drafted to legitimize the coup because it came from use of force. There was uncertainty whether it would be accepted, so lawyers proposed a referendum, using the voice of the people for legitimacy. If there’s a new coup d’etat to topple the 2007 Constitution, you will be effectively robbing the people of the power—you yourself asked them to vote in the referendum. Even the 1997 Constitution had no referendum. It would be going against the people—about the 60% who voted in the referendum. [The Constitution] is not a toy. Wouldn’t it be an insult to the people? You can’t have a coup, if you want to talk principle. Jomquan: The person who talked about this has mainly been Khun Suthep, and Article 3 is the explanation from the PDRC side. Prof Likhit: Article 3, then where’s Article 2? Where’s Article 2? Jomquan: But looking at Khun Suthep’s explanation, he didn’t necessarily leave out the Head of State component, which is the King, because Khun Suthep said he would appoint a prime minister and a cabinet for the King to endorse. Prof Likhit: And where did he get that power? Is it not in violation of Article 2? It also violates Article 68—which is toppling the democratic system. It’s in violation of Article 70: the duty to protect democracy, and Article 71: the duty to obey the law. And blocking elections violates Article 3: the people’s rights, and Article 72: the citizens’ duty to exercise their right to vote in elections. And after 20 million people have voted, the election is ruled unconstitutional. That’s a violation of 20 million people’s rights. All wrong. Those without knowledge keep talking and people get confused. Sovereignty can’t be claimed in this way. If those claiming sovereignty cite [the sovereign power of] the people in Article 3, then how many people do they have? To find out how many people they have, there must be a general election. Then we’ll know if the number is in the majority or in the minority. Or, because the 2007 Constitution came from a referendum and Article 3 says the power belongs to the people, you can have a referendum whether or not to have a new government. You can’t just claim a great mass of people on your side. What if the other side claims a great mass of people too? Then we have two sovereignties. So how many people do they claim? How many people can they claim? Prof Likhit: Then why does it have to be Khun Suthep? The other side could say the same thing: There’s a vacuum so we’ll make ourselves sovereign. Do they have the right? What number to go by then? Can you imagine? All of a sudden you stand up and say I have the power. Where from? Because the other side can make the same claim, then we have two sovereigns. Jomquan: For a person to “declare sovereignty”/ him or herself “sovereign” in a traditional or historical practice, how does this work? Prof Likhit: As I already said: 1) Use force to give yourself power [like] a coup d’etat, once that’s done, you become sovereign. When the Council of Democratic Reform (CDR) staged acoup d’etat in 2006, Khun Sonthi Boonyaratglin became sovereign. All power was in his hand. That’s why the first order was to declare a democratic system of government with the King as the Head of State and effectively return the sovereign power to the King—theoretically speaking. 2) Royal succession. In ancient regime it was called ราชาภิเษก (raja-phisek – “coronation”)—that’s the sovereign. If with the use of force, ปราบดาภิเษก (prabda-phisek – “enthronement”). 3) Election. Who has the most votes get to be prime minister or president. 4) If none of the above, use personal charisma, which doesn’t happen any more these days so no need to talk about it. These are four means to become sovereign. Not suddenly declaring and claiming what? Article 3? Is it claiming for just yourself? Or for a group of people? How many? What about the other side? They can also claim it. Where do you get the legitimacy to say you are superior? A great many people? How many? How do you measure the number? Jomquan: In looking for a comparison, the closest is the  coup d’etat. But this time, suppose Khun Suthep “declares sovereignty” even though he has no weapons and security agencies are not doing anything, except making sure there are no clashes, can this be considered as accepting or allowing Khun Suthep to take action? Prof Likhit: Where did he get the power? Is the Constitution still in effect? The action violates Section 113 [of the Criminal Code]. It’s an insurrection in the kingdom and violates how many articles I have mentioned? Article 2 in the Constitution, Article 3, the part that’s not cited. Articles 70, 71, and 72. It violates both the Criminal Code and the Constitution. How can it be legitimate when it violates all kinds of provisions? If this is legitimate, then why has a certain political party distanced itself from it, denying profusely they have nothing to do with it? Dissociated themselves, didn’t they? That political party, instead of supporting [Suthep declaring sovereignty] why not join in from the beginning? Why retreating? Even the military is retreating. They dare not talk of it, right? So what’s this? It’s evident. Why say it’s a hypothetical scenario? Can you hypothesize the country? Can you make a joke of it? Let me say this, if you don’t have enough knowledge and listen to academics who don’t have enough knowledge either, you’ll botch a big job. I don’t doubt their motive. But if you don’t know, please stop. Thai society is becoming a mess. The studies of both political science and law now get muddled. [Teachers talk outside their area of expertise.] Students are confused. People in society are made confused. Jomquan: But some academics have come out and said that the PDRC’s explanation isn’t in violation of the Constitution. Everything that’s happening happens because there’s a vacuum, there’s no other way, and if Khun Suthep’s sovereignty plan is followed they confirm that it’s still within the provision of Article 3. Prof Likhit: Who let you do it, if the other side can also do the same? Jomquan: Suppose Khun Suthep declares sovereignty. Prof Likhit: Then that side will declare it too. Two sovereignties. Jomquan: Please permit me to leave the other side of the people aside for now. The question is whether those who can say one can declare sovereignty or not are the national security people, the military and police (besides the other side of the masses). Is it the [state] security agencies that can say you can or cannot declare sovereignty? Prof Likhit: What kind of power do security agencies have, besides use of force? Why not stage a coup then? But if they are only talking, there must be a legal rationale. You don’t just say you can do it. Who are you? Who vested power in you to use it? No matter who you are in the security agencies, who gave you the power to say that? There is still the Constitution, so don’t say it’s legitimate. Are you talking against the Constitution? Then, why have the Constitution at all? Get rid of it. Get rid of the Constitution that came from a referendum. Can’t you see, this is not about common sense. If you want to claim legitimacy, then where is the Constitution? Unless you tear it up, you can’t claim that, because the Constitution is still here. We still have the Senate and the caretaker government, [although] we don’t know yet if the PM and the cabinet will all be removed. If all will all be removed, then there’ll be another issue to deal with. Or even transfers of government officials. From now there’ll be no governing in the country [when the executive branch] aren’t allowed to govern. You get punished for transferring an official. The Senate, the House of Representatives can’t perform their functions. They pass a law and can get impeached and removed for doing something illegal. Who rules this country? The powers of legislative, executive and judicial branches are separate [but] all of a sudden the courts have the powers to decide on everything and become a supra-organization, with the highest power of the land, even more power than the sovereign. I’m putting this very clearly. If anyone, any agency, has doubts, come and debate with me. Choose an issue to discuss. I’m saying all this because I want what is right, the truth. I’m an academic, a Royal Institute fellow, I don’t want to see this mess. You understand? Jomquan: Yes, I understand, sir. Now, from your explanation, people can see clearly in the case of the military [staging the coup]. I’m not making a joke, but if the situation comes to that, can it not be a redefining of sovereignty in the Thai history? Prof Likhit: Of course, anything can be done in Thailand. See a cat and say it’s a dog. See a dog and say it’s a hen. Anything can be done. You can issue laws retroactively. You can interpret laws with two or three standards, or no standards. We could make a law requiring Thai people to walk on their heads with their feet pointing upward. Anything is possible in Thai society at this point; there’s no longer anything left to hold on to now. Let me tell you, what has happened is hugely dangerous. There are three perilous things that happened: 1) a political cul-de-sac with no way out due to conflict based on irrationality; 2) political immobilization [in which] all mechanisms are without the authority to govern—the government can’t work and the officials can’t work due to unjust orders from illegal use of force that violates government regulations; 3) anarchy—Thai society is now drifting with no way out. There are no rules and law. Anyone bent on winning to preserve their own interests and power must realize in the end that they are destroying the fundamental political and social structure and mechanisms of our society. The most important is the faith among the people in our country—one with a reasonably long history. All this will crumble. There isn’t much pride left, you know. You feel embarrassed abroad. There’s no telling what’s right or wrong any more. It’s all confused. Issuing laws retroactively. Giving different verdicts [on the same legal issue for different people]. The separation of power among the legislative, executive and judicial branches is now all a mess. There’s no system like this, and it’s the most worrying. I’m saying this bluntly because we’ve been dancing around the issue for too long. Those who are involved, you must be responsible. Okay, you may not have the feelings but you must take responsibility because history will record what you have done to this country. NOTE: This article was first published on SiamVoices, Asian Correspondent and Prachatai English on 6 May, 2014.
thanks for this timely translation of a really good interview.